Based in Kent we offer homeowners and businesses across the south east region the very best in natural stone, glass and ceramic tiling installations. Established in 1995 we’ve brought the highest standards in domestic and commercial tiling services to homes, businesses and even embassies for over 19 years. Focusing on quality in our work and products we work with a range of materials including ceramics, glass and natural stone such as limestone and marble. We only employ fully qualified tilers to work at Estwall Ceramic Services, knowing that our high quality standards can only be consistently delivered by highly experienced professionals. Always aiming to deliver a very personalised and bespoke service we carry out a complete survey, offer advice on the different tiling materials and provide good turnaround times at competitive prices. Our Kent bathroom and kitchen tilers maintain reliable and consistent high standards by working with the best materials and products on the market, and by carrying out full preparation works on every project. Clearing off previous installations we skim, screed, latex and plaster floor and wall surfaces to get an ideal foundation for tiling that will last for years and years. Full insured and working to a detailed health and safety policy that every member of the team is aware of their responsibilities under, we are also full members of the Tile Association for your added assurance. With previous clients including Orange retail stores, Marks and Spencer’s and the Dutch Embassy in London with Estwall Ceramic Services you’re guaranteed exceptional customer service and finish quality. We provide high quality domestic and commercial tiling installation services to customers in Kent, Wimbledon, Maidstone, Rainham, London, Battersea, Clapham, Gillingham, Wandsworth, Kensington, Balham, Dover, Chatham, Chelsea, Rochester, Cobham, Bromley, Canterbury and Sevenoaks. For further details of our services click onto the domestic tiling installations and commercial tiling pages of this website. 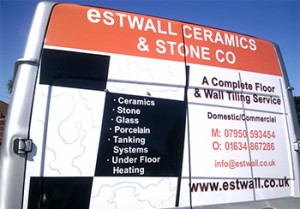 Of course we also welcome enquiries at any time and our friendly and experienced tilers are always on hand to answer questions; contact us at Estwall Ceramic Services today to arrange your no obligation survey and quotation.